The Om Reiki Centre specializes in Sydney Reiki courses for students who care about the quality and depth of their healing practice. What's more, we teach all of the key elements of the traditional Japanese Reiki system – many of which are missing from the vast majority of Reiki courses today! The course designer, Jeremy O'Carroll, has studied Reiki from many of the world's best Reiki teachers in India, Thailand, Hawaii, mainland USA and Australia, has visited Japan several times - and uses a unique 7-step learning process to guarantee powerful healing results. He is a former lecturer and tutor at the University of Melbourne, has been teaching Reiki full-time since 2007, and is the author of over 100 Reiki articles. He has also written two novels: Full Speed and (the soon to be released) Call of the Silver Cockatoo – novels about finding your true self amid the pressures and expectations of everyday life. Who Will Benefit from Our Sydney Reiki Courses? "Enlightening yet peaceful. Absolutely recommend it!" Our courses are also ideal for anyone who is susceptible to the 'negative energy' of people, places and spirits. Through a series of classical Japanese meditations, we teach you how to 'protect yourself' by strengthening the 'hara', one of your body's key energy centres. To find out how this works and why most 'protection methods' fail, click here. "I enjoyed every minute of it and couldn't get enough. We had a great group of people and the energy in the room was fantastic. Jeremy has a wealth of knowledge and I just wanted to pick his brain!" Reiki uses a special form of 'ki' (Japanese for Qi or energy) to rebalance and then charge the body's energy system. It doesn't heal the body itself, rather it gives the body the resources needed to do so. With regular practice, many Reiki healers feel happier, healthier, more productive and better able to deal with situations that would previously have caused large amounts of stress. They also often report feeling mentally clearer and better able to make decisions. To give you an idea of just how powerful Reiki is - and how quickly it can work – watch the 2-minute video below. Using the centre's high-tech aura machine, the video shows what happens when the founder of Om Reiki – Jeremy O'Carroll – heals a client. Note how in less than two minutes, the client's chakras and energy system improve dramatically. "Very informative, fun, good metaphors / explanations, stories. Professional yet fun and relaxing. Nice group. Good location." One reason that many Reiki courses fail to get optimum results is that they lack system and structure. This is particularly prevalent in Western Reiki lineages (i.e. those that have been part of Reiki's journey from Japan, to Hawaii to the rest of the world). The reason for this is that many Reiki teachers have added techniques from other healing modalities. This has occurred over the last six decades and has resulted in much of what is currently called 'Reiki' having little or nothing to do with the original system. "It is presented in a very down-to-earth way, very intelligently and doesn't take itself too seriously but still treats Reiki with the utmost respect. I didn't expect to get so much in tune with energy so quickly." That, of course, doesn't make these techniques bad. The problem is simply that the coherence of the original system has been lost. There are many valuable pieces, but they don't fit together in into a harmonious whole. While the Om Reiki Centre teaches material (like the chakras) that was not part of the original system, the integrity of the original system is never lost. Where new information is taught, it is clearly highlighted, enabling students to get a better vision of why things were originally taught as they were and why - occasionally - it might benefit them to incorporate additional techniques into their practice. "Well constructed, flows well, professional delivery, interesting content." The result of this is that they experience a system where each piece complements the other and they have a steady experience of energetic progress. Reiki attunements (energy ceremonies that connect students to the Reiki energy. Meditation techniques that refine and strengthen a student's connection to energy. 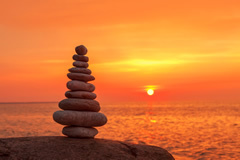 Mantras and symbols (only introduced in level 2) that help students strengthen their connection to certain forms of Reiki energy. Reiki precepts or principles that promote a healthy energetic system, facilitate powerful cleansing and provide a philosophical and spiritual backdrop to Reiki practice. (To find out why most Reiki courses are missing up to 50% of the original Japanese Reiki system, click here. To learn more about the origin of the Om Reiki Centre and its mission, visit the About Us page. "Surprised me and exceeded my expectations. Thank you." One of the major reasons many Reiki students fail to continue with their practice in the years following a course is that they are given little - or no! - structure or guidance after it. As a result, their Reiki becomes a little like most gym memberships: it's used and enjoyed for a short burst of time but is then forgotten about the moment life grows busy. To ensure students get consistent, long-term benefits from their course, the Om Reiki Centre is dedicated to supporting students well beyond its conclusion. In fact, it even offers pre-course material to energetically prepare students for the weekend. While not part of the traditional Japanese Reiki system, crystals can nevertheless be used to complement (and strengthen) Reiki healing. During our Level 1 Reiki courses, we include a bonus section on cleansing crystals, meditating with crystals, and using them with Reiki for powerful healing. At our course, we have a large selection of crystals which you can use throughout the weekend, and we will let you know which crystals will be most useful to you based on your energetic strengths and weaknesses. When Jeremy first started teaching Reiki 10+ years ago, he taught Reiki as he had been taught. This meant that students did pretty well what they did everywhere else: they rocked up for the course, attended it and then said 'ciao'! Nowadays it seems crazy to teach like this, but this is what almost everyone – even to this day – still does. They run a course over two days – we hope! – and that's that. Students are not primed before the course to help them get the most out of it, and they are not guided afterwards (to ensure mastery and follow through of the techniques learned). This means that even though almost everyone enjoys whichever Reiki course they take, most students don't get nearly as much out of it as they could. Perhaps in part due to his background in teaching (Jeremy lectured and tutored at the University of Melbourne), and in part due to experience, Jeremy soon realized that students needed a lot more support to extract the maximum from his course. As a result, he introduced both some pre-course exercises and a post-course 21-day program. The pre-course work is simple to do, and includes two important meditation practices (with video instructions and downloadable audio files) as well as general information on how best to prepare for your course. The meditations can easily be done by anyone – even students who haven't practised meditation before – and they will ensure you are energetically ready to get the most out of your weekend. The post-course 21-day program is done principally via email, and involves us sending you daily emails with techniques to practice, and further information to deepen everything you have learned. With thousands of students going through Om Reiki and ten years of experience, we know the likely challenges you will face post-course, and this 21-day program is designed to not just help you overcome these but also develop real confidence in everything you have learned. Although you sometimes see Reiki being taught online, the truth is you do need to learn it in person (surprise, surprise!). 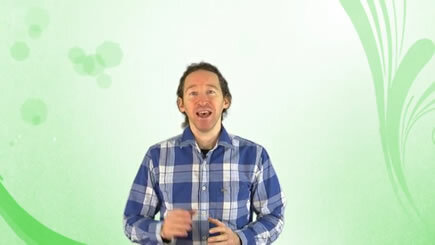 That said, there is no doubt that once you have attended a course, online video support can help a lot. To make sure students can both remember and go over material taught (and, quite often, even extend it! ), we have developed a beautifully presented and detailed Level 1 video portal which you can access on both your desktop and mobile devices. The video portal includes instructional videos on pre-course work, post-course work, as well as all typical challenges students are likely to encounter. 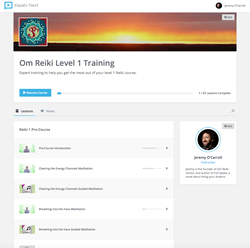 The portal also includes bonus Reiki articles, mind maps, and downloadable meditations (so you can go over the meditations we did in the course). It is a unique feature of our courses that helps take your Reiki to a deeper level. To get an idea of how our video portals work, you can sign up for our free introductory portal 'Everything You Need to Know About Reiki'. 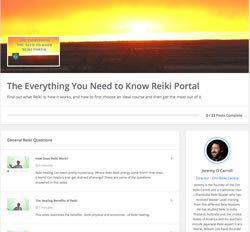 It has videos on all of the commonly asked Reiki questions, and will show you the quality of our video portal platforms. (Note: None of the videos shown in the Level 1 portal are found in this introductory portal). Sometimes you have a unique question/situation that isn't covered in any of our teaching materials. If this is the case, then we're happy to answer your questions – no matter how silly or weird you think they might be!– via email or phone. Simply call us on 1300 853 356, or write to us at info@omreiki.com.au. We have been holding regular monthly practice nights for almost ten years now in Melbourne and are now finally going to be holding them regularly in Sydney. They are the perfect place for you to continue with your Reiki practice, learn new meditation and Reiki healing techniques, ask questions and make friends with like-minded people. With 1340 people in our group and a 5-star rating, we are most likely Australia's largest and most trusted group of its kind. Know all key hand positions and how they help you increase the power of your healing sessions. Have an understanding of the 5 Reiki precepts and how they can help you overcome past hurt and energy blocks. Have practised several meditation methods - like breathing into the 'hara' (an energy centre below the navel) - for increasing the flow of chi and strengthening healing. Know how to smooth the aura and cleanse the body of energetic impurities. Have a basic understanding of the chakra system, how it effects our wellbeing and how Reiki can strengthen it. Learn techniques for developing intuition when healing with Reiki. All courses at the Om Reiki Centre are recognised by the ARC - Australia's leading Reiki association - and the Association of Australian Reiki Professionals. Our certificates will also be recognised by all traditional Reiki associations around the world. This is important to anyone who is considering becoming a Reiki practitioner or using Reiki as part of an already established healing modality. Sad to say, but in most of the Reiki courses Jeremy O'Carroll attended, the manuals he received were little better than a collection of plagiarized photocopies! Taken from a multitude of sources, these materials hardly fit together, making them of scant value. To ensure the Om Reiki Centre didn't fall into this trap, he has created a high quality, 70-page original manual that covers all of the course information in a logical, coherent, and step-by-step manner. As a result, you will never be left struggling to recall any of the key concepts that we teach. It is all there in precise detail. The manual is the fruit of many years' experience and research and will prove a great reference tool for any personal or professional Reiki work that you go on to do. All participants will also receive complimentary tea (mostly herbal) and a selection healthy nibbles (nuts, apricots, chips and the like). We are conducting courses in Redfern at Hatha Yoga Sydney, which is conveniently located right near the Redfern Railway Station. (Suite 6/15 Woodburn Street, Redfern, NSW 2016). This beautiful studio is close to neighbouring suburbs Surry Hills, Newtown, and Alexandria, and accessible to the rest of the city by train. It the perfect place to relax and enjoy your Reiki class. Our Sydney Level 1 Reiki courses come with a 100% healing success satisfaction guarantee. 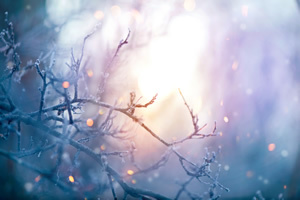 If you come to one of our courses, see it through to the end, and can't connect to Reiki energy, simply tell us at the conclusion of the final day and we will refund your entire course fee. To enrol, simply click on the 'Add to Cart' button below. (Instructor: Fiona Neeson) Venue: Hatha Yoga Sydney, Redfern. All courses have a full-refund satisfaction guarantee. For more information, please contact the Om Reiki Centre. For details of our upcoming level 2 course, see our Level 2 course homepage. Although we offer a full-refund satisfaction guarantee for those who attend our Level 1 course, we do not offer a refund if you change your mind about our course without attending it. If you give us two weeks' notice, however, we will be happy to alter the date of your course. If you wish to change dates between 13-3 days before the course, you will be charged a $100 change-of-date fee. We cannot change the date of the course if we are given 2 or less days. So if you decide to enrol, commit to coming, be there rain, hail or shine. There is great power in that, and it will ensure you have an amazing experience. Remember: after enrolling, doubts sometimes come up. This is normal. Your ego - your small self - is not just afraid of change, it knows that Reiki will create change! It knows how powerful it is. So if your ego resists, laugh at it and trust the intuition, the inner guidance or inspiration that had you enrol in the first place. It will never fail you. 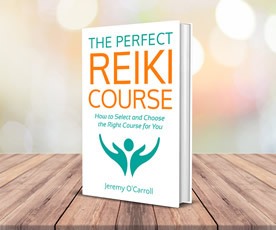 Right now, Jeremy O'Carroll is giving away free copies of his latest book 'The Perfect Reiki Course – Everything You Need to Know Before Your First Class'. It answers all your pre-course Reiki questions, like what you should learn in a course, who can benefit from a course, how Reiki works, and much more. This 191 page book even tells you how to select and then prepare for a Reiki course once you have chosen it. The fruit of Jeremy's 10+ years of teaching Reiki full-time, you can consider it your pre-course Reiki Bible. Take the next step, learn powerful new skills, and get the qualification needed to work as a Reiki practitioner. Find out about our next level 2 course. Want to develop your practice and learn to teach Reiki? Try our unique Melbourne Master level course (Nov. 3-5). Get free access to our new 'Everything You Need to Know About Reiki Video Portal' and have all your Reiki questions answered! Relax and energize in beautiful Daylesford. Go deeper into your meditation, learn new skills and make lifelong friends. Try our Jan. 3-6 Meditation Retreat. Click here to download the Om Reiki and Pellowah 2018 Calendar as a convenient PDF flyer. Learn to connect to your body's key energy centres. Discover how to tap in to your energy field. Delight in a simple method that lets you flow with your thoughts rather than fight them. Learn more about our Aug. 25-26 CBM Meditation course by clicking here. Why Take a Reiki Course? Reiki courses are a great to improve your health, heal hurts from the past, and connect you to your true Self. Feel a deeper connection to their true Self. A wonderful thing about Reiki is that you don't need to practice for years to become aware of it. Indeed, many practitioners feel it right after being 'attuned' (a practice in which a Reiki master helps a student to connect to Reiki energy). Naturally, your connection to Reiki does improve with practice; but its presence and many benefits will most likely appear pretty well right away. If you still don't think the course was worth the investment, we will happily refund your entire course fee. "Was worried I wouldn't feel the energy or be able to treat others. That I would be too different to others attending and feel self-conscious. All fears put to rest! "It was exciting, relaxing and mind-opening. It puts you in touch with different aspects of yourself. It's extremely calming...Joyful experience to meet others and give them Reiki." "The course felt more 'complete' than expected. I feel very enriched and empowered. I really felt a connection with others in the group. The course makes you more aware of your spirituality and the possibilities available. Make you realise how much control you have over your thoughts and feelings." "Wanted to learn how to do Reiki and now I have learnt the tools and can confidently go away and practice it on myself and others. It was fantastic and you feel great and more confident within yourself." "would recommend Om Reiki to others. Because of the quiet and serene environment, the structure created by Jeremy that was so gracefully implemented by Louise's calming beautiful nature, it was a weekend and attunement I will always remember." "It opens people up to something bigger than them and gives them connection to a deeper part of themselves. Quite, quite beautiful. Jeremy is a gorgeous character!" "Exceeded my expectations. Reiki is such an effective self-help tool and the workshop was a very safe and comfortable place to be. Jeremy, you are a very easy person to be around which made learning that much more enjoyable." "Didn't know what to expect. In a way it has left me with a sense of 'wonder' & some type of deep respect for Reiki & what possibilities could come from learning and practicing techniques. Everyone would benefit." What happens when you stop living other people's dreams? This is the central question to Jeremy O'Carroll's novel, Full Speed - a story about love, creativity and having the courage to live your passions. Full Speed is fast-paced, funny, irreverent and filled with wisdom. It will also inspire anyone who is looking to live their dreams when without the support of their friends, family or society. Order your 1st edition, hardback copy of Full Speed.